We had a very good turn-out for the November workday that preceded the Fall Fly-In event. A lot of work got done and the weather was excellent! Here are the highlights! Fokker Dr.I Triplane The big news was that the Fokker Triplane returned to flight, and Ron Marcotte made a video of the event and posted it on YouTube. Click through and watch as Steve Freeman flew the airplane. Ron titled the episode a "touch and go", but in reality Steve landed on one of the rougher parts of the runway and found himself airborne again after being launched off a hump so he just added power and went around. 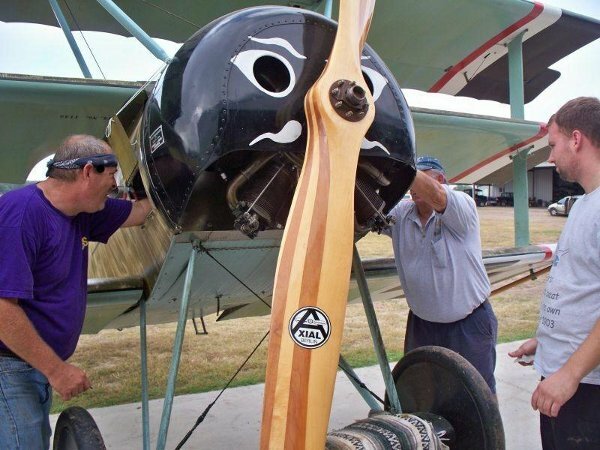 The day started with Cameron Whitaker returning the Triplane's Scintilla magneto which he'd cleaned up and overhauled. Mike Craig and Don Craig went into action installing the mag and timing it correctly. Afterwards it was time to try and ground run the engine. Which didn't go as well as hoped! Investigating the issue resulted in Mike and Don pulling the mag and trying again to get it stabbed / timed properly. This process yielded success and resulted in a very successful ground run. Steve wanted to try and fly the airplane and did so in the afternoon. All work on the field stopped to watch, and the flight was pretty well photographed and filmed! For once it looked like Steve was actually enjoying flying the airplane - though he still had the landing to perform! Ultimately the landing went well and the airplane was towed back to the hangar. Steve still notes some engine vibration but the general consensus is that the plugs need to be replaced. The search for replacement plugs is on! The Meyers was prepped to fly during the day and Mike Craig got a ride with Steve. They were gone for a while; it was Mike's first biplane ride as well as his first tail dragger flight. Mike is working on his pilot's license and really enjoyed the trip. 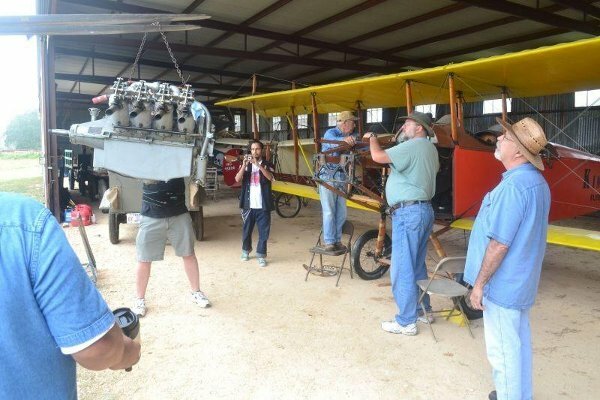 The final preparations for installing the engine were carried out in the shop, after which the motor was hoisted up on the tines of the forklift and trucked across the field to the Old Hangar. It took thousands of "supervising" eyeballs to ensure the forklift was raised enough to get the motor over the Canuck's engine bay yet still squeeze under the hangar door opening! But eventually everything was aligned and the old OX was lowered into place on the Canuck's engine bearers. Dave Edgerly then took over, working with Bob Gardner, Billy Cheshire, Dave Orloff and Ian Whittaker to start connecting up everything that needed to be hooked up so the motor mounts could be bolted down. Ian was specifically recruited to do things like reinstall the water pump at the back of the engine because he is slender and flexible and there is very little room between the back of the motor, the firewall, and the engine bearers! Once the engine was cinched down onto the engine bearers the aircraft was moved across to the shop's concrete apron for further work. Dave Edgerly began tearing down the carbs to clean them up and get everything working properly. The day ended with lots remaining to do on the Canuck! With the sale of their parent's house in Sealy Ian and Cameron brought back the Dormoy project. Currently it is being stored in the rear of the old hangar! Work done so far looks very good, but man that sure is a tiny airplane! Thursday before the Fly-In Kevin Monahan washed the Triumph and filled it with oil and gas, oiled it well and adjusted tire pressure to ensure all was well for the event. Kevin also installed the new license plates on the vehicle. 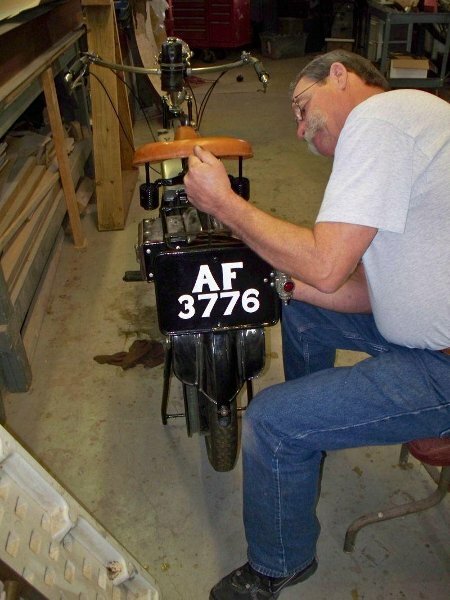 The new license number was found under the paint and stickers when Kevin refurbished the front fender plate, so he modified the rear plate to match. The bike now wears a license number it once had when operational on UK roads. On Friday Kevin put the Indian back together and got it running. Kevin hasn't had much time to work on the Indian's clutch issues as he is eyeball deep in his first paint & body project - the Indian's fuel tanks! Kevin has been learning a lot and is intent on producing a very nice finish on the fuel tanks. But sometimes it is two steps forward and one step back. Kevin has had to strip one of the tanks of the bondo he'd applied because of contaminants in the mix so he is starting over with that tank. Kevin is trying to smooth out the weld seams and warps in the tanks - he reports that each tank was made from four pieces, plus all the knobs and drains and filler holes welded on! Kevin has one tank ready for Olive Drab paint, but it was in much better shape than the tank he has been struggling with. Kevin has also made some new fender stays and those are also ready for paint. But nothing will get painted till the other half of the fuel tank is ready also! The workday saw the usual fussing about with the Model Ts, getting them ready for the Fall Fly-In the following weekend. Everything seemed to be fine with most of the Model Ts, the exception being the Blue Racer which is still down with drivability issues. Work is progressing on the Blue Racer, so there is hope it'll be running for the Fly-In. Model Ts were driven to lunch at Ebbo's in downtown Kingsbury to get a little extra drive time on them. 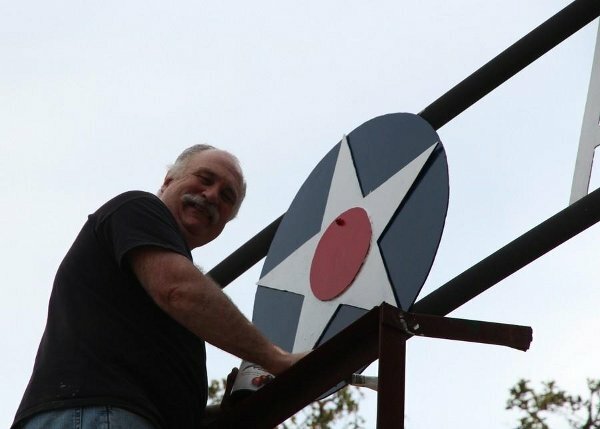 Charlotte pulled a "Tom Sawyer" and convinced Al Sumrall and Kurt Maurer to paint the sign arching over the property's entrance before the Fall Fly-In. Kurt slyly offered to operate the forklift if Al would do the actual painting. Al took the bait - hook, line and sinker! Al ain't no Michelangelo, so we were all lucky the task was more like "paint by numbers"! Al did a great job on the repainting, but the operation wasn't without some drama. Al was initially surprised at how things swayed around up on the forklift but he quickly adjusted to that. What really threw him was coming across a "boa constrictor" in one of the tree branches, about two feet from Al's face when Al first noticed him. Al says the evil monster was about a foot long and big around as Al's finger! Despite being faced with a lethal killer Al stayed moderately calm and finished the painting while keeping an eye out in case the ravenous reptile decided to make Al its next meal. Sensing Al's fear the cold-blooded man-eating brute feigned indifference while it waited for the perfect opportunity to strike and take his hapless prey down, but Al wasn't playing that game and quickly painted some distance between himself and his stalker. Al was extremely relieved to finish the job and get returned to earth without being squoze and devoured! Al really did a great job on the painting though - it looked very spiffy for the Fly-In. Next step is repairing the sign at the split in the property's road! So our "Thanks!" to Charlotte for conning Kurt and Al into repainting the sign and to Al and Kurt for completing the task!